A Book Spotlight is not a review, but a feature of a book by a person I know and admire. Susan Midalia is best known for her critically acclaimed short story collections, The History of the Beanbag and other stories, The Unknown Sky and other stories and Feet to the Stars and other stories. In each of these story collections, she has demonstrated her great skill at getting inside the heads of characters from a wide range of backgrounds and ages, and telling their stories. In The Art of Persuasion, her first novel, that character and point of view belongs to Hazel West, a 25 year old ex-teacher who is living in a share house with her best friend Beth and just trying to make it in the world. Once a teacher, Hazel is now not entirely sure what she wants to do with her life, and so to pass the time, she decides to read the classics, starting with A-- so she begins reading Jane Austen. The book in question is Persuasion, Jane Austen's last written novel (for I believe, Northanger Abbey was written first but published last), and arguably one of her more mature comedies in which Anne Eliot must persuade her former admirer Captain Wentworth to fall in love with her again after she sent him away seven years earlier. While this particular book does teach Hazel a few things and makes her think about love, relationships, and persuasion, this is not simply a novel that modernises Austen. Hazel agrees to volunteer on a doorknocking campaign for the Greens ahead of an upcoming election. There, she must spend time with Adam, a charismatic older man to whom she feels strongly attracted. Can the art of persuasion be used not only to convince voters in the leafy Western Suburbs to care about climate change and asylum seekers, but also to convince Adam to give loving Hazel a chance? I won't tell you any more about the plot of the book because much of the joy of reading is in the discovery. 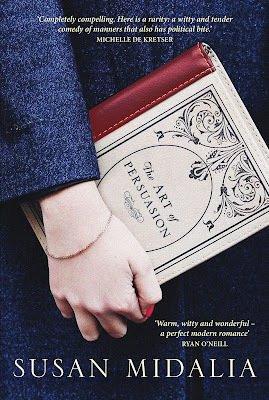 And there is much to discover and love in The Art of Persuasion, whether it be the clever and satisfying plot, the sassy, witty and strong heroine, whose journey is far, far more than just a quest for love, or even just the love of language, words and literature that come through on the page. I found myself writing down facts about the origins of words, or jotting down the names of short stories to read later, recommended on the pages of the book which was a true delight. Without straying into preachiness, this novel talks about important issues of the day whether they be politics, gender equality, or issues faced by students and teachers in our schools, and it does all of this in a very clever, very entertaining way. The tone of this book is light and funny without being trivial. Quite simply, I could not put this down, and within reading a few chapters, I was already recommending it to friends and co-workers. So do yourself a favour-- head down to your closest bookshop and ask them to order you a copy of The Art of Persuasion. You won't regret it. The Art of Persuasion is published by Fremantle Press this April.